There’s no denying that a baked potato covered with baked beans is just the ultimate in easy, simple comfort foods. It’s the classic university student staple as it doesn’t require much in the way of culinary genius and it’s a really inexpensive (but still filling) meal. Although it’s certainly not the worst thing you could eat, along with most dishes favoured by those making their first foray into the kitchen it’s not the healthiest thing ever as tinned baked beans tend to be full of sugar (and other unfavourables) and potatoes can be very starchy and therefore quite stodgy. But if you know us, you’ll know that we believe there’s always a healthier alternative to be created. 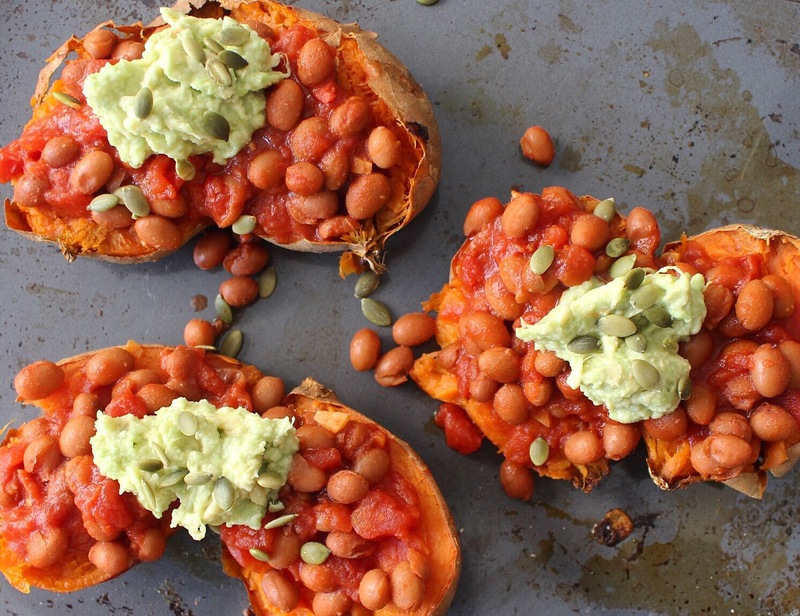 So we’ve been re-living our early 20s by cooking up these jacket sweet potatoes with delicious smokey homemade baked beans, and boy are they good! They’re equally as affordable as the original (if you stock up on the garlic, olive oil, smoked paprika, tamari and maple syrup the first time you make them you’ll only end up paying about £1 per person for the other ingredients) and whilst they might require a tiny bit more effort they also have a LOT more to offer in the flavour department in my opinion! Recently I’ve gotten really into meal prepping on the weekend, so I’ll make a big batch of these beans and freeze them so that when it comes to the weekdays all I have to do is bung some sweet potatoes in the oven, defrost the beans, heat them up and stick them on top! I love love love these with a dollop of guacamole or with a side salad and some houmous, but if you do eat dairy you can also add some grated cheese or sour cream too. 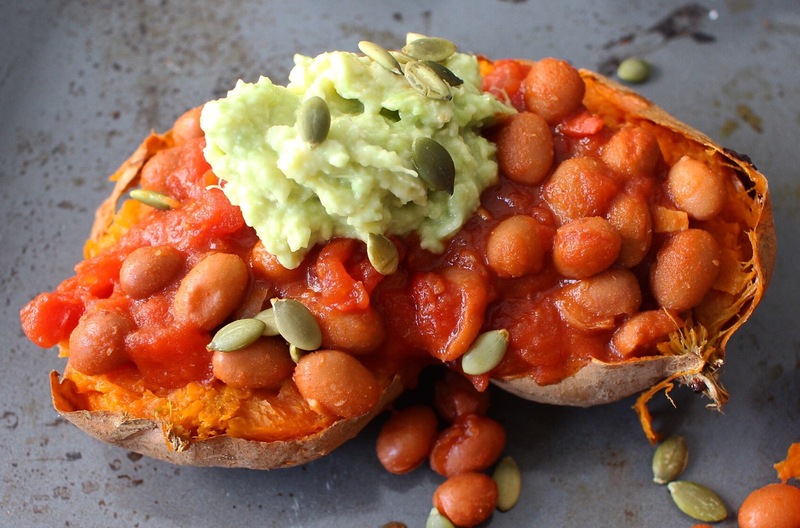 Either way, it’s such a great meal and so good for you as the beans are packed with protein and the sweet potatoes are great for energy but also a great source of vitamins, minerals and fibre! Preheat the oven to 180C, stab the sweet potatoes with a fork a couple of times and then pop them in the oven to bake for an hour. For the beans, in a saucepan heat the olive oil on a medium heat and saute the garlic for a couple of minutes until soft. Add the smoked paprika, tamari and maple syrup and cook for a couple of minutes until it is slightly sticky, then add in the beans and chopped tomatoes and simmer on a low heat for at least half an hour (or until the sweet potatoes are ready).